It was time to check up on the piggy farm so a 2-day leisurely road trip to Bogo made for a nice getaway. Little did I know when I shot this video that later that night I’d be fighting off an attack in downtown Cebu, but that’s another story. Here, however, atop a hill just outside of Bogo it was peaceful, quiet and there’s a fantastic view from up there all the way to the northern shore of Cebu. I make a trip to Bogo about every three to four months. Partly to see the progress of the piggie-farm and partly for the nice drive along the coast. Some wonderful female company makes that all very nice as well. Bogo is about a two-hour drive North along the coast. Lots of interesting little places to stop along the way. Mostly small barangays along the shore and one or two public beaches. Although the beaches along this area are kinda rocky, not sandy so it’s mostly nice to just stop and hang out a bit to relax under the palm trees rather than do much swimming. People along the road sell everything from snacks to fruit and handmade crafts. On one of the trips I made there the radiator sprung a leak so I had to stop about every ten minutes and get water along the way and I got to see just about every little town along the way. There are two places I’ve eaten along the coast on the way to Bogo that I recommend. The first one you’ll only find it by pure luck because I can’t remember the name of it and can only tell you they have a really nice patio that looks out onto the ocean from under a nipa-hut. Pretty good food and cheap prices. The other place has two locations. I’d been to the smaller, original ‘Duko Duko’ (that’s the name of the place) but now that I’ve been to their new location I like the bigger, newer one better. This first photo to the right is their original location and as you head north the newer one is about five minutes up the road, also on the left-hand side of the road. It’s strictly Filipino food which I happen to love so don’t expect burgers and fries. The Sinigang soup is good and I also like the Beef with Carrots in tomato sauce as well.. I love that over some white rice. 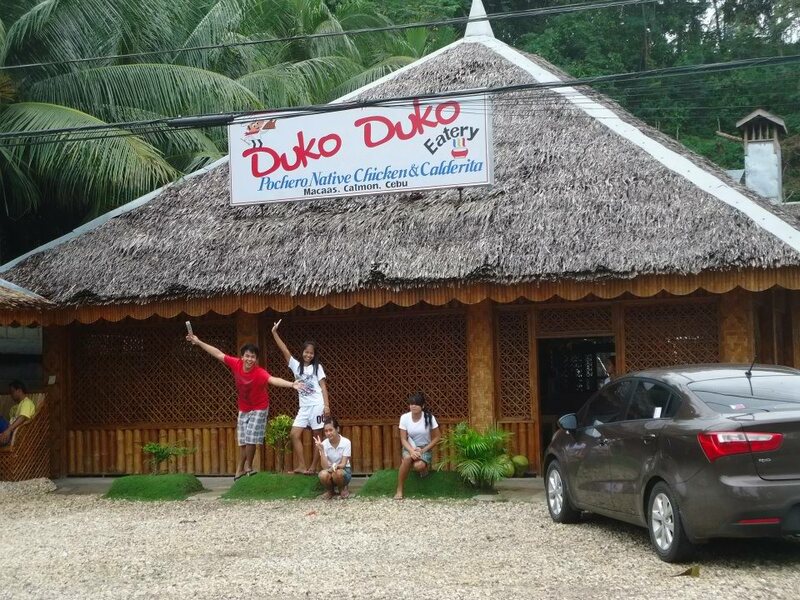 The new Duko Duko location is pictured here below. Nice people, good food and very reasonable prices. About $3 USD per person. It gets a bit warm during middle of the day in there so they have fans, but you have to turn them on yourself. Free self-serve drinking water is available if you don’t want soda or beer. Once you get to Bogo central the main place to hang out in the evening is over at the Pier. There are some karaoke places there and a nightclub that I didn’t check out since I was down with the flu that night. But it looked like a lot of fun. It’s not a big mecca or anything, just a quaint little town where you see people playing chess out on the street or cooking up some BBQ. Now, earlier in the day my female companion called a friend to ask where we could get some good pizza. They recommended this place called ‘Pizza Point‘. Now, I was really hoping to write up a good review on the place. But, my guess is they are better at making stuff like Kidney Pies than pizza. I mean, if you’re gonna call a pizza a ‘Meatlover’s Pizza’ then there’s an expectation it will have more than just pepperoni and a few sprinkles of sausage. I’d also ordered the Chicken Pot Pie which, I have to admit looked home-made and looked really good. It was ‘pretty good’ but needed more salt. I’ve had Chicken Pot Pie at Knott’s Berry Farm, Marie Callendar’s and a few other places that were much better. I also ordered my usual.. a Pina Colada. I don’t know what the hell was in there but upon later reflection it kinda sorta tasted either like coconut wine or some really cheap rum. I have a pretty good stomach for booze but ten minutes after a few sips of this stuff and I knew I was gonna get sick. (and sure enough, was puking in two hours) Not from the food, but from whatever hootch they used to make up what should have been a Pina Colada. So, for the record.. Pizza Point, I’m not a fan. What I will say in their defense is that they have very clean restrooms with toilet paper and everything. Out here, that’s enough to justify coming in from the heat for a San Miguel Lite. Which I happen to know they keep very cold because the owner noticed that some of the beer was so cold it was beginning to ice-up in the bottle. The drive to Bogo is a nice drive. Just watch out for incoming traffic when you’re passing through a barangy. We almost nailed a tricycle that drifted into traffic out of a side-street at 3mph. Also in Bogo is a place called Warren’s Beach Resort. I really like that place. It kinda secluded and right on the shore with a swimming pool, decent rooms, billiards and their own restaurant with a great view of the ocean. Beautiful landscaping too. It’s not in Bogo, but is near it over in San Remigio. What I like about it is that it’s it’s only about 4 acres and isn’t all crowded up, at least not when I’ve been there. It’s got a nice breeze from the ocean, great views and makes for a nice get-away without spending more than about $40 USD for lodging and food. My only qualm was that the particular bed I got seemed kinda lumpy. But I can sleep just about anywhere. However if you’re entertaining for the evening, you may want to ask if you can check out the room first and test the bed out before checking in. Hope you enjoy the video and stay tuned for more..
Next Post:JTOL – All Foreigners Are Rich, Right? I’ve been to the shrine and to Warren’s, but never stayed at Warrens. 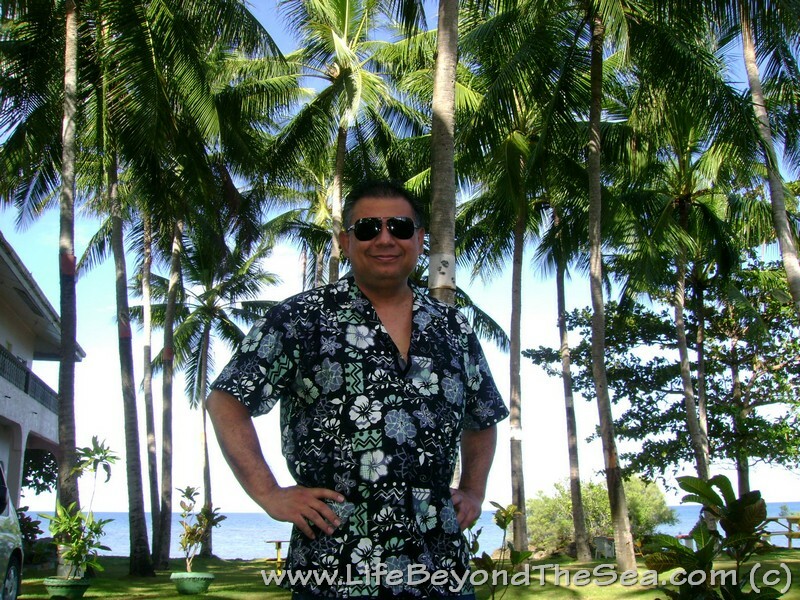 I have stayed at Hagnaya Beach Resort in San Remigio. Hagnaya has some tacky plastic animals up above their nice pool, but the resort itself is very nice. The beach is rocky, but you have a good view of Bantayan Island, and the Korean golf course Queen’s Island is nearby. You can rent a small room for around $40, their restaurant is good and very spacious. Another place that used to be good, but fell into slight disrepair, then to be damaged and closed because of Yolanda was Nailon Beach Resort in Bogo. I’ve been to Bogo several times and have spent a few Christmas’s there. It’s true, there’s nothing like Christmas in a small Filipino city.